The original “Blind Garden” in Astley Park was built in the 1953 for the blind service men returning from the war to use. The garden was re-planted in the 1990s as a commemoration to the former Mayor Keane, however it then fell into disrepair. The Friends first put forward a proposal to rejuvenate the area seven years ago, however progress was initially slow until late 2011 when, in consultation with the Council, it was decided to submit a grant bid to Veolia for around £30,000 with additional funding from the Council to make up the balance required. Two Friends members, Jan Sanderson and Sarah Hunter spent many hours drawing up extensive planting plans and plant lists for the designated area. Unfortunately the Veolia bid was unsuccessful however the Council surveyed local opinion on various proposals for the Park and the garden scored very highly, therefore, thankfully, the Council decided to fund the project. Work started in April 2014, once again Local craftsman Jack Ashurst from Adlington Dry Stone Walling was employed to rebuild all of the stone walls, create new French oak benches and install stone plaques depicting the history of the garden. Local sculptor Thompson Dagnall was commissioned to design bespoke oak carved benches and the Astley mole. With the work completed in early June volunteers from the Friends, Galloway’s Society for the Blind and Council employees planted the garden, spread bark chip and installed braille plant labels. The Council also undertook to water the Garden regularly until it became established. 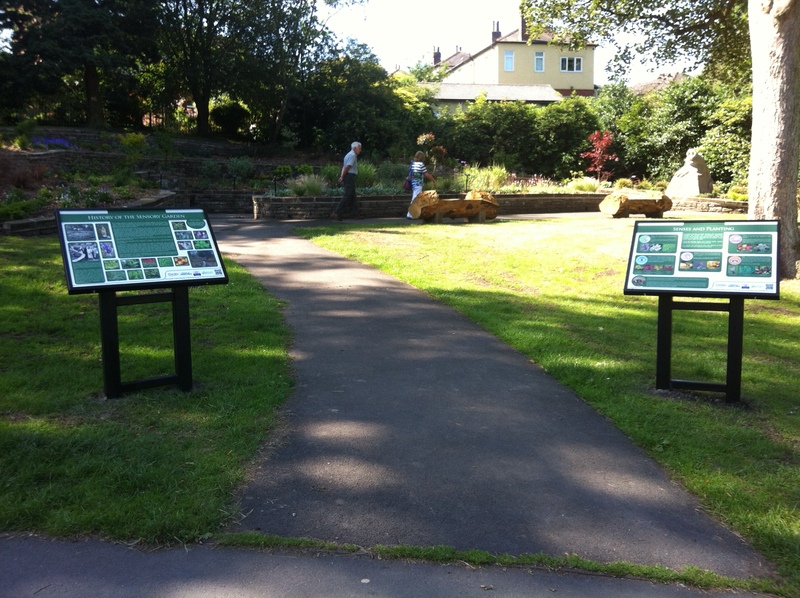 The finishing touch was added with the installation of two interpretation boards detailing the history of the site, planting and the effect on senses. The Garden was officially opened on 23rd July 2014 with all the parties involved in the project present. The Friends are very proud of their achievement in bringing this area of the Park back to life, we hope the people of Chorley and visitors to the Park will appreciate and enjoy visiting the Garden for many years. In conjunction with the Council we are committed to regular maintenance with weeding, tidying and pruning when necessary. We also wish to express many thanks to Lindsey Blackstock – Parks and Open Spaces Officer and Jamie Dixon – Head of Streetscene & Leisure Contracts at Chorley Council for their unflagging support throughout the project.